Putting a parking structure here, as suggested by a councilor, would be a mistake. The adjectives that come to my mind for parking structures all start with d: Dark, dirty, drafty and dank. And possibly dangerous as well, especially late at night. That’s why I hope all this talk about a parking structure in downtown Albany is just that and nothing more. Back in 2001, when the downtown urban renewal district known as CARA was formed, the list of 51 possible projects did include two parking structures. A “government center parking structure” with ground floor retail or office space was proposed near City Hall and the Linn County Courthouse. It was No. 27 on the list. No. 28 was a multi-story parking structure on Water Avenue east of Lyon. The projects were put on the list but never seriously considered. Since then the city has conducted one or more surveys that found no serious parking problem downtown. Still, in 2011 or thereabouts an updated downtown “refinement” plan called for a parking structure at Water and Broadalbin where the Eagles lodge is situated. The Eagles took vigorous exception, and nothing more was heard of that. The topic came up again last week, briefly, as the CARA board considered a potential streetscape improvement plan. And at the city council meeting Wednesday (Oct. 28), Councilor Rich Kellum floated this idea: If there’s ever to be a parking structure, how about building it closer to the center of downtown rather than on the riverfront? He suggested that it be put on the city-owned parking lot of Two Rivers Market. Look, when the city creates an organization whose actual mission is to spend money for the sake of spending money, stupid stuff happens. And every property tax dollar spent by CARA was first diverted away from its intended purpose. That doesn’t seem to shock us. If we aren’t appalled by CARA violating the trust of every property taxpayer, why should we be appalled by CARA wanting to spend millions on an unneeded parking garage? As you wrote, a parking garage is in the CARA Plan and now an ARA member is floating the idea. Those are pretty clear signs that something is happening. We’ll see how much ‘resistance’ now surfaces on the Board. And CARA’s biggest apologist, Bob Woods, has declared a parkiing garage is “inevitable.” He’s not an Albany resident and has no skin in the game, but he represents himself as an expert in all things CARA. He counts for half a sign, perhaps a quarter. Maybe two cents is more accurate. I agree totally. There are alternatives to parking structures that are being explored. Population and business growth will make a structure inevitable. Dark an dank is possible, especially when the radicals demand that the cheapest option is the only one that should be built. Being innovative might yeild a design that can make things much better, possibly even iconic. It just takes vision and risk takers, the kind of folks who are making a success right now downtown. Unless we start building high rise buildings downtown, or in some other way increase the business density downtown, there are other alternatives to parking structures. That is what we “radicals” are working on here in Albany, right now. I’ve yet to see an “iconic” parking structure…EVER! Care to provide an example, Bob? Hasso had it right with his 5 “d’s”. We don’t need a structure now, or in the foreseeable future. Bob, we can handle Albany matters within our own ranks. Thanks. For you foreseeable is next Tuesday. For everyone else it is within the next 10 years or so. Business owners have been discussing it for at least the last 5 years because they perceive the need. You and Gordon are just a couple of couple of gnats buzzing around. An annoyance that distracts, but easily swated away. More inflated rhetoric and hyperbole from the master. I agree with Hasso. These structures are not pleasing to the eye, nor are they safe even with security. I owned a store in the Ogden City Mall for eight years that had one of these monstrosities, and the community constantly complained about the negative features, most ly about the lighting and safety. That mall was demolished a few years ago in favor of a more open shopping area downtown. Albany will forever be historic, a multi level parking structure will never be accepted, unless a quality hotel chain comes downtown and would need a structure that blends in with the complex. As I live on 5th and Calapooia, I shop and visit downtown a lot. I have yet to encounter a situation where I can’t park close to a business (within a block or two). The county courthouse is perhaps the most visited, and even there, I usually park close, but when not, it’s not more than a few block walk. If handicap access is the issue, then it seems that this could be addressed by designating more spaces as handicap only rather than a new structure. I really do not see the need now, or in the next 10 years for a structure. Salem has at least one parking structure. It would be interesting to know how attractive it is to the general public. I find the parking structure quite useful in Salem, downtown by the Nordstrom and all the other stores connected by skywalks. I use it most times we shop there, as there is not street parking available, One park on an upper level and take the skywalk into the upper store of the malls. It is very convenient. However, this is not the situation in downtown Albany. We do not have a mall downtown, nor the many, many other business that Salem has. If that day comes, I will fully support a parking structure, but we are not there yet, and I see no indicators that we will be in the next decade. If a property owner wishes to build a multi-story structure, what on earth do the opinions of others have to do or say about it! Perhaps the owner would lose his shirt, or perhaps it would bring more commerce to downtown. Let the workings of supply and demand hold sway. Peg, it’s not a “property owner” in the conventional sense…it’s the City of Albany. And if the City loses its shirt….WE LOSE our shirt. We have plenty to say about it. We’ll know when we need one, if ever. Right now the city lots are far from full capacity. The MANY unrented spaces in the city’s rental lots could be converted to free if needed. Mr. Carrick, you are correct. The City of Albany is not a property owner in the conventional sense. I say the City has no legitimate right to build a parking structure or even a parking lot on flat land. All property should be held privately. It is the definition of property actually. A PARKING STRUCTURE ??? Cut me a break. That is the very last thing our little town needs. 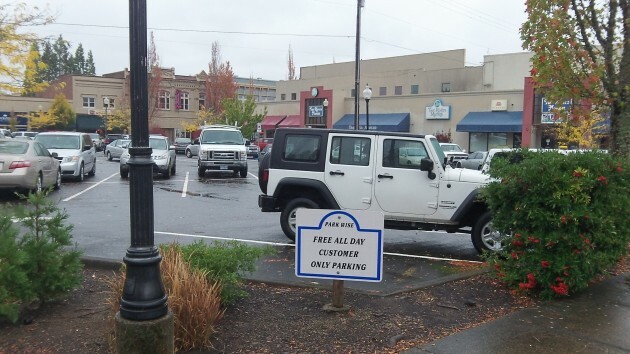 Finding a place to park in town has never been a issue for me or most folks….